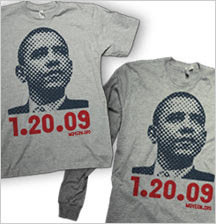 If you want a shirt to celebrate Obama's inauguration, MoveOn's giving them out if you make a small donation to their campaign to help Barack make progressive change. I just ordered mine and it should arrive in time for my inauguration trip. I plan to wear this as another layer over my jacket on the big day. For a small donation you can get your own t-shirt. Click this link to get your shirt! 44 more days to go!